Three generations of the Shmeltzer family gathered at TAU’s Raya and Josef Jaglom Auditorium to inaugurate the Shlomo Shmeltzer Institute for Smart Transportation, which will support the research and development of advanced technologies that promise to revolutionize the field of transportation. 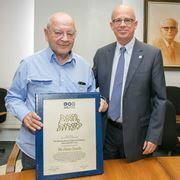 The Institute commemorates the late Shlomo Shmeltzer, founder of the Shlomo Group, one of Israel’s largest automotive and services companies. "The vision of the Institute is a fitting legacy for Shlomo Shmeltzer, a born entrepreneur, and a sharp and sensitive businessman," stated TAU President Joseph Klafter at the ceremony. "Shlomo was an innovator in the automotive field in Israel, and now, in his memory, the Institute will innovate with an interdisciplinary team of leading researchers. It will open the way for new directions in R&D, in cooperation with industry players and with government agencies." Asi Shmeltzer, Shlomo's son and Chairman of the Shlomo Group, noted that, "My family is deeply committed to advancing Israeli industry and specifically the transportation sector. Supporting the Institute is just like investing in a start-up – except that the results and outcomes are for the good of society at large." Headed by Dr. Tal Raviv of the Department of Industrial Engineering, Fleischman Faculty of Engineering, the Shmeltzer Institute will address the profound changes expected in mobility and transportation over the next few decades – mainly electric and autonomous vehicles, as well as shared transportation services such as bike and car-sharing. Institute-affiliated researchers will come from diverse disciplines: Data science and operations researchers will enhance cooperative and shared transportation services, which have grown tremendously in recent years as sustainable alternatives to owning private vehicles. Data science experts will develop methods for analyzing the vast quantities of real-time data available from vehicles, sensors and mobile phones to optimize traffic and transportation systems, while at the same time attempting to prevent malicious use of this sensitive information. Operations research and artificial intelligence methodologies will be used to optimize the design and operation of these systems. Behavioral scientists will address the human factor in developing efficient, safe and easy-to-use applications for smart transportation. 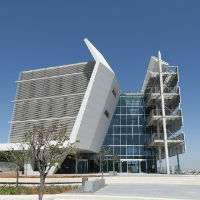 "Shlomo was loved and respected for his openness to new ideas, concern for others and social responsibility – all values that are held in high esteem by Tel Aviv University," summarized Prof. Klafter, "For this reason, this new partnership is an excellent fit and we feel privileged and grateful that the Shmeltzer family chose to establish the Institute here."